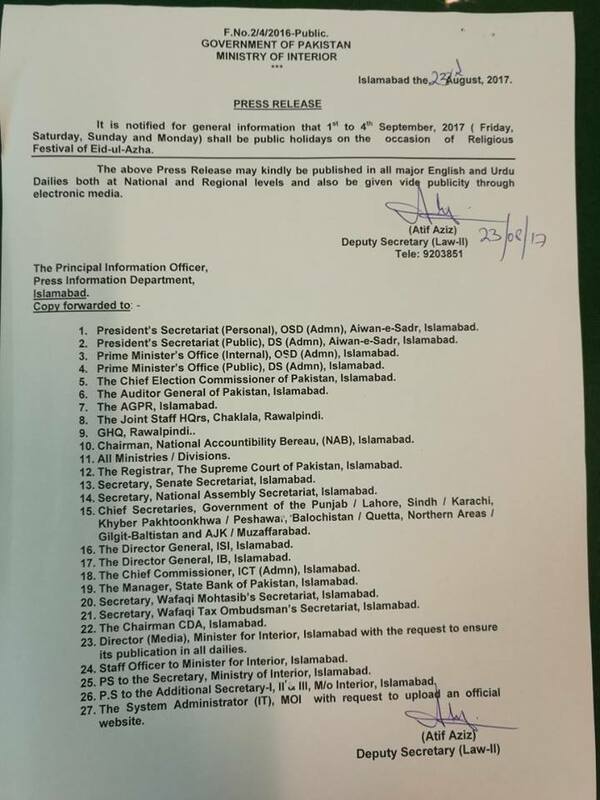 The Ministry of Interior has announced 4 days of Eid-ul-Azha holidays in a notification released on Wednesday. The auspicious event will be celebrated on September 2 Saturday, and the holidays have been announced starting from Friday, September 1, to Monday, September 4. The event is celebrated on 10th of Zil hajj, while the 9th of Zil hajj is revered as Day of Arafah (Youm-e-Arafat). Interior Minister shared the official notification of the Eid holidays on his official Twitter account, saying that Friday, Saturday, Sunday, and Monday shall be public holidays. 1-4 September holidays for eid ul azha approved by Ministry of Interior. Previously, the Central Ruet-e-Hilal Committee announced that the moon was not sighted on Tuesday and that Eid-ul-Azha will be celebrated on Saturday. The Kingdom of Saudi Arabia will celebrate the occasion on September 1 and August 31 will be the Day of Arafah. sirf 2 and 3 off hain, 1 and 4 are public holidays bro.